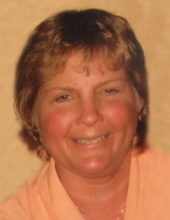 Kristi Ann Young, 59, of Nevada, passed away Saturday, January 12, 2019, at the Israel Family Hospice House in Ames. Memorial visitation will be 5-7 p.m. Thursday, January 17 at Rasmusson Funeral Home (1418 Fawcett Pkwy) in Nevada. Kristi was born February 20, 1959, in Ames, the daughter of Howard and Doris (Swanson) Bergman. She graduated from Stratford High School in 1977 and DMACC in Boone. On October 10, 1987, Kristi was united in marriage to Evan Young in Stratford. She worked for the State of Iowa, Judicial Branch help desk and enjoyed cross stitch and vacations to Minnesota with her family. Kristi is survived by her husband, Evan of Nevada; her son, Ryan of Nevada; and her brother, Brian (Carol) Bergman of Stratford. She was preceded in death by her parents. In lieu of flowers, memorial contributions may be made to Bliss Cancer Center in Ames. To send flowers or a remembrance gift to the family of Kristi Ann Young, please visit our Tribute Store. "Email Address" would like to share the life celebration of Kristi Ann Young. Click on the "link" to go to share a favorite memory or leave a condolence message for the family.